Daniel Jacobs returned to winning ways and began his hunt for another world title after outclassing and out-pointing Luis Arias in New York. The 'Miracle Man' had not boxed since taking Gennady Golovkin the distance in March, but slipped back into the groove with a unanimous decision success. Jacobs showed his fluid and sharp offensive skills still put him above most of the middleweight division, with a 118-109, 120-107, 119-108 shut-out sending out a reminder to champions 'Triple G', Saul Alvarez and especially Billy Joe Saunders. The New Yorker topped the bill at the Nassau Coliseum, Long Island, and had the previously unbeaten Arias down - albeit controversially - in the 11th round to underline his dominance. Arias claimed he had just lost his balance before touching the canvas but a short left from Jacobs helped him on his way. 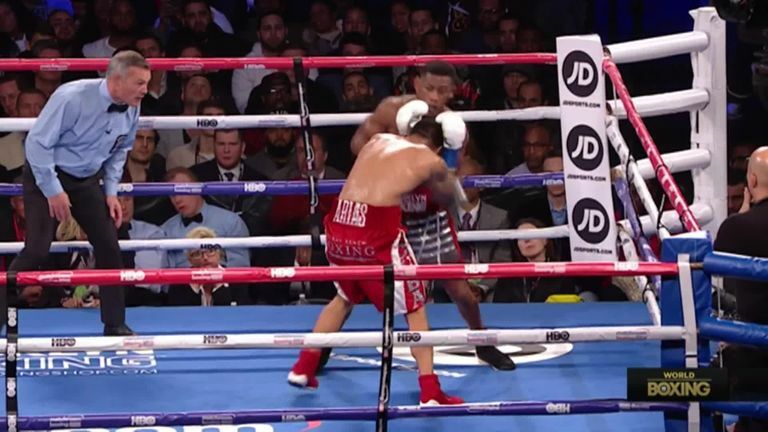 In a similar fashion in the opening round, Arias fell but no knockdown was given, and in the second a hard right had the visitor stumbling across the ring again. It set the tone for Jacob's dominance, showing off an array of skills. His jab was an obvious weapon, his right landing regularly and he counter-punched whenever Arias tried to close in. The middle rounds were all Jacob's but to Arias' credit he opponent pushed on, perhaps knowing he needed a knockout to swing the balance his way. Jacobs, though, seemed to enjoy the rough stuff late on, his inside work - particularly the uppercut - meant there was only going to be one outcome. "It wasn't one of my best performances but I definitely felt I dominated the fight," he told Sky Sports. "I wanted to get a really, really impressive knockout and I think that's what I was lunging for a bit more than I should have, instead of putting my combinations together. "But I've been out for some time but now I can stay more active, I think I will be stronger in the future."